About the size of an SD flash memory card or postage stamp and weighing just 1 gram, the new Ball Grid Array (BGA) SSD form factor is almost an inevitability for eventual use in MacBook laptops and Apple iPads. About a fourth the size of currently typical 22mm x 80mm M.2 PCIe SDS modules, two of the emerging BGA SSD sizes are 12mm x 14mm or 16mm x 20mm. This space savings matter. With motherboards shrinking in size drastically, much of the available space in a notebook or tablet are now devoted to batteries, and that's just that much more space that using a BGA SSD will leave for higher capacity batteries. Some of the more immediate benefits of BGA solid-state drives will be better heat dissipation directly through the motherboard's surface. Able to operate a lower voltages down to 1.8v, the amount of heat generated will be significantly reduced as well - while still delivering the astonishing Read/Write speeds that PCIe flash memory is capable of. Samsung's already begun high-capacity production of 3, 16mm x 20mm Ball Grid Array modules in 128 GB, 256 GB, and 512 GB capacities using 48-layer MLC V-NAND that can deliver up to 1500MB/s Read speeds. And you can bet Apple's already testing them in lab prototypes of MacBook and iPads. When such products reach market isn't far off. With nearly eighty percent of all Mac computers sold Apple's venerable MacBook is the most likely candidate for a Mac compatible SSD drive upgrade. For many older MacBooks (and even iBook's) there's a huge range of off-the-shelf 2.5" IDE and SATA laptop-sized drives that make an ultra-fast drive swap a highly compelling upgrade. Although many older Apple laptop models may now be limited as to which version of Mac OSX they're capable of running, when properly formatted for MacOS there's no denying a MacBook Pro SSD upgrade can breathe unprecedented new life and performance into any aging Mac. Thanks to backward compatibility, even older SATA I and SATA II MacBooks will perform as best they can with a fully compatible 2.5" solid-state SATA III drive that's the norm of what's currently shipping. Things get more challenging with newer MacBooks starting in 2012 and beyond as Apple started transitioning away from 2.5" hard drives to custom pin-out SSD drive MODULES. Look to OWC - Other World Computing and Transcend for 3rd-party aftermarket Apple compatible SSD module upgrades - though note they're very MODEL-SPECIFIC depending on the year it was released and whether it's a Pro or Air MacBook - shop carefully! Use Apple System Profiler to identify your exact MacBook model name and numbers. More recently, as in 2014 and later, Apple began the shift away from the Serial ATA - SATA interface towards the much more robust and higher-bandwidth PCIe connectivity. PCIe is poised to be the dominant solid-state drive interface for the next 5 years and beyond. 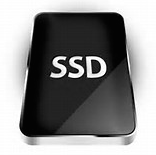 But once again, custom pin-outs from Apple will severely limit your aftermarket SSD drive upgrade choices. Shopping for a DIY MacBook Pro or Air M.2 SSD drive upgrade solution? There are quite a few SATA III and PCIe adapters currently shipping that might help you convert many industry-standard M.2 solid-state drive modules to the custom pinouts Apple uses in it's MacBook Air and Pro laptops. With a combination of the right M.2 adapter and the proper SSD blade you MIGHT be able to cobble a working solution that's compatible with your Mac laptop at a lower price or for better performance than you'd get with OWC's or Transcend's custom-made solid-state modules for Apple laptops. Might is the key word here. As I look at the various M.2 SSD adapter cards (whether they're PCIe or SATA III based) - It quickly becomes very complicated and confusing. Exactly which Year / Models of MacBook? For Pro or Air? PCI or SATA? X2 or X4 speed PCIe? What Brands / Part #'s of Samsung, Kingston,Toshiba, SanDisk, etc. SSD modules are or aren't supported? What size / length? Are they bootable with Mac OSX as a startup disk or not? "About MacBook Air SSD interface standard: 1: 2010 and 2011 version MacBook Air SSD is 6+12 pin, only one side have contact, size is 109 mm*24 mm. It's SATA interface. 2: 2012 version MacBook Air SSD is 7+17 pin, size is 109 mm*24 mm. 2012 version MacBook Pro SSD is 7+17 pin, size is 89 mm*33 mm. It's SATA interface. 3: 2013 and 2014 and 2015 version MacBook Air SSD is both side have contact, one side is 16+12 pin, the other side is 11+14 pin, size is 89 mm*24 mm. It's PCIe X4 interface. 4: 2013 and 2014 and 2015 version MacBook Pro SSD is both side have contact, one side is 16+12 pin, the other side is 11+14 pin, size is 89 mm*33 mm. It's PCIe X4 interface." All things considered, this market is just too deep and complex and filled with too many variables for me to cover well. True hardware upgrade nerds groove on figuring all these specifics out and performing the upgrade themselves. But the average Mac user just wants a simple, affordable solution. For them I simply recommend whatever off the shelf, direct plug in Apple spec modules they can order from Transcend or OWC and leave the adapter / retrofit M.2 SSD Apple solutions to the kind of guys that prefer cheaper DIY complexity over retail solutions. Shopping for a larger or faster MacBook Air solid state drive? There's many options to upgrade your MacBook Air SSD but it's a long - and complicated journey. Since it's first introduction, the MacBook Air has evolved from 1.8" PATA-IDE to 1.8" SATA drives to custom mini M.2 SATA module now on to custom mini PCIe interface SSD blades. As such, using Apple's System Profiler and the model # imprinted under your MacBook Air is essential to ascertaining EXACTLY which kind of SSD blade / module / drive might be appropriate for your upgrade. Because of the evolving interface changes and lack of critical mass marketshare for any one particular MacBook Air model, the number of aftermarket SSD upgrades is rather constrained. Apple's use of non-standard pinouts in it's modules/blades didn't help either. Apple eschewed using standard M.2 or MSATA sockets that the Windows PC world widely embraced in laptops and netbooks. OWC has long had the lion's share of aftermarket solid-state drive upgrades for MacBook Air computers. More recently, Transcend International has begun to compete in this space since they were the OEM supplier for many of Apple's modules in the first place. Transcend and Samsung were the primary OEMs for Apple's factory installed SSD's. 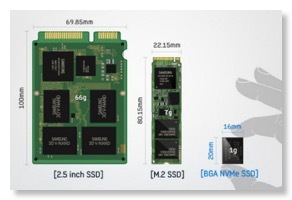 Transcend decided to pursue the consumer market with working, Apple compatible SSD module designs already done. Both OWC and Transcend not only offer the larger and usually faster SSD blades - but sell them as upgrade kits with an accompanying USB 3.0 mini blade enclosure to help with the OSX system transfer - and to let you use your older, smaller module as a Mac backup drive.